If John Kerry doesn’t win an Oscar for his performance in Moscow on Tuesday, then there’s something very wrong with the system. From the time he touched down at Moscow’s Vnukovo Airport, to the time he left some 26 hours later, the Secretary of State was as cordial and conciliatory as anytime in recent memory. There was no hectoring, no lecturing, no threats of additional sanctions and no finger-wagging condescension, just pleasant give-and-take on the main issues followed by friendly chit-chat, multiple handshakes, and plenty of smiley photo ops. To say his hosts were surprised by Kerry’s behavior is a probably an understatement. After nearly three years of nonstop belligerence and confrontation, the last thing Sergei Lavrov and Vladimir Putin expected was an ingratiating Kerry oozing brotherly love and carrying on like an old buddy from college. The US is “not seeking regime change in Syria”? No one saw that one coming. Maybe someone should remind Kerry that the Decider in Chief Obama reiterated the “Assad must go” trope less than two weeks ago. Now all that’s changed? Apparently so. This has got to be the biggest foreign policy somersault in the last two decades and Kerry carried it off without a trace of shame, in fact, he never veered from his cheery script the entire trip. Case in point: In one particularly absurd photo, Kerry is seen grinning ear to ear while high-fiving Lavrov like he just got news that his horse placed first at Churchill Downs. Needless to say, Washington’s Skull and Bones diplomats know how to turn on the charm when it suits their purposes. And that’s exactly what’s driving Kerry’s slobbering tone and the “Can’t we be friends again” jocularity. Washington wants something, and its willing to devour a rather sizable crow to get what it wants. Okay, but were the Russians taken in by Kerry’s performance? I have repeatedly stated and I am ready to stress once again: we will never agree with the idea that a third party, whoever this party is, has the right to impose its will on another country. This does not make any sense and it’s a violation of international law. As soon as we notice the political process has begun, and the Syrian government decides it is time to stop the airstrikes, [we are going to stop] … The sooner it [the process] starts the better. So why is Kerry wasting everyone’s time with all this glad-handing and kowtowing when the Russians are obviously not taking the bait? The Syrian Army, Hezbollah and the elite 4th Mechanized Division are closing in on strategic town of Al-Zorba which will complete the encirclement of the country’s biggest city, Aleppo, cutting off critical jihadi supplylines to the north and signaling the beginning of a final offensive to clear the city of the many al Qaida-linked groups operating in the vicinity. This is the beginning of the end for the Jabhat Al-Nusra, Ahrar Al-Sham, and other terrorist vermin who currently occupy the city. The Syrian Army has also made great strides in capturing the area along the Turkish border. On Tuesday, the 103rd Brigade of the Republican Guard – in coordination with the National Defense Forces (NDF) took full control over the strategic Al-Nuba Mountains after a ferocious week-long battle with Jabhat Al-Nusra. Once the Latakia offensive is concluded, the Turkish border will be sealed and it will be impossible for terrorists to come and go as they please. That, in turn will lead to a long mop up operation within Syria itself. 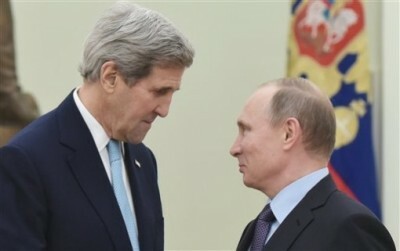 In any event, the situation on the ground is bad enough that Kerry decided it was better to swallow his pride and climb-down on the “Assad must go” demand, to see if Russia would go-easy on Obama’s “moderate” terrorists presently fighting in Syria. This is the real reason Kerry flew to Moscow. Got that? The Saudis want to spearhead the fight against terror, which is bit like Xaviera Hollander chairing the Chastity League. Naturally, the macabre irony of the endeavor was lost on the media which reported the story without questioning the credibility of the source. So what’s this new charade all about? It’s another attempt for the Saudis to get a shoe in the door so they can raise more hell in Syria. They think that if they create a “broad-based international coalition” then they’ll be able to deploy their homicidal crackpots into Syria with impunity. It’s all part of the neocon plan to rip Syria apart by occupying a vast stretch of land in east Syria and west Iraq to establish Sunnistan, a de facto terrorist sanctuary where the Washington-Ankara-Riyadh axis can continue its proxy campaign for as long as they want keeping the Middle East in a permanent state of anarchy until the elusive Caliphate finally emerges and the last drop of oil has been extracted by avaricious western oil giants. Fortunately, Putin is going to put an end to this nonsense. And he has the arsenal to do it too.